Tired of going to the same old places with your family or your guy on weekends? Why don't you check out a restaurant that will surely be familiar to your parents and is cozy enough for a romantic dinner for two? Casa Marcos, a well-loved Spanish restaurant established in the 1940s, reopened last year after disappearing from the culinary scene for over a decade. Now, you and your parents can enjoy the original recipes they loved all those years ago! The new branch, which you can find near Burgos Circle at The Fort, replicates the old world vibe with its cozy interiors and a poster of the original pelatoria. As you settle into your seats on the second floor, you'll notice that the home-style furnishings are very different from the flashy fast food interiors we're used to seeing today--and pleasantly so. 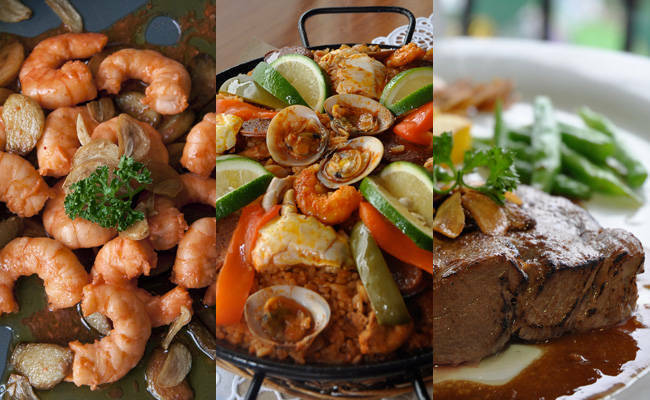 A glimpse at the menu will transport you to a time when Spanish cuisine was at its peak in the country. For starters, order the Almejas (P230), a baked clam dish that has a generous topping of yummy melted cheese and garlic flakes. Another recommended appetizer is the Gambas (P275), the ubiquitous Spanish shrimp dish cooked Casa Marcos-style with garlic cloves. Meanwhile, meat-lovers would love the juicy and savory Tenderloin Tips (P310), which are cooked with roasted garlic and have a distinctive taste that will make you crave more. To make your meal extra special, order the Prawns Thermidore (P495), which consists of three huge tiger prawns baked in a creamy bechamel sauce, topped with button mushrooms and garlic, and smothered in cheese. It's served with a side of string beans and potato wedges to complement the rich flavor. For your meat dish, you can't miss Tenderloin a la Pobre (P495), a delectable steak cooked to perfection in oil and garlic. Or, if you crave something more sinful, get their tender Fillet Mignon (P510), a mouth-watering steak wrapped in bacon and covered in mushroom and ham gravy. No Spanish meal would be complete without an order of paella! Their Paella Valenciana (P645) is packed with chorizo, chicken, and a variety of seafood on a bed of rice seasoned with paprika. It's a huge serving good for four to five people, making it a great choice for a family meal. As you converse and bond over the delicious food, you can wash down each bite with a sip of sangria from their bar. Choose from Red and White Sangria (P395 each), served in tall carafes that are good for sharing. Casa Marcos is located at F121 Forbeswood Heights Condominium, Rizal Drive, Bonifacio Global city. For inquiries and reservations, call 552-3781 or 703-7784.